As a human, Nieve is not exactly intimidating; at a whopping 5'0", she is incredibly short, and she has a slim frame, weighing no more than 105 lbs soaking wet. She's lean and wiry, built for agility rather than strength. Her skin is a light but warm shade of brown, a natural bronze colour that means she isn't quite as prone to burn in the sun as those who are paler. 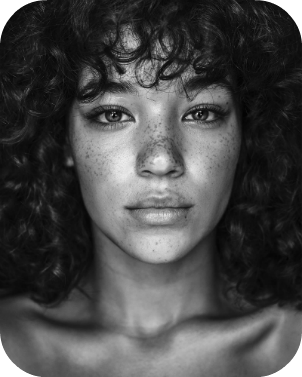 Dark freckles scatter her face, clustered mostly on the bridge of her broad, button nose and speckled more sparsely along her high cheekbones. 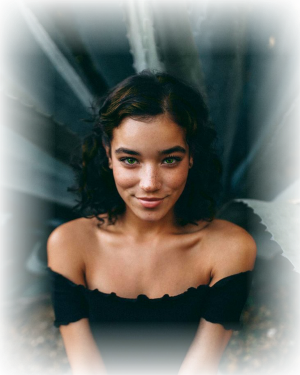 Her hair is relatively thick, usually cropped short to her pointed chin and never longer than her shoulders; it is most often in its natural, untamed state of messy, slightly frizzy curls, but on the rare occasions it is brushed out properly is rather sleek and straight. Her curls are mostly dark brown, almost black, but are brindled with streaks of a lighter, orange-y brown as well. Her eyes are almond-shaped, and an unnaturally pale, vivid shade of green with slitted pupils. Evie has a full mouth that hides a set of neat teeth whose canines, while not quite fangs, are sharply pointed; her tongue is also rough and sandpaper-y, much more akin to a cat's than a human's. While possessing these traits that are indicative of her animal side, most people would not be able to tell Nieve is not human at a glance; it would take a keen observer to put the details together. Perhaps the most glaring thing that signals to others that Evie is not human is her mannerisms; she moves quietly and with purpose, her sinewy body holding a natural grace. She also tends to stare at people frequently and intensely, and will go long periods without blinking, even if maintaining eye contact. It is also common to see her with half-lidded eyes when she is lazing about or particularly content, and she frequently makes noises in the back of her throat in such states to signal her contentment, comparable to purring when she is in her feline form. While most comfortable naked, as it is easier to shift forms and most comfortable in the heat and humidity of Syka, Nieve does in fact own and wear clothes. Most often she can be found lounging in a dark brown loincloth whose ends just barely brush her knees; this is sometimes accompanied by a deep green scarf tied around her chest, but not always. Unless venturing into the jungle, Evie is always barefoot. She doesn't have any piercings nor visible scars (yet); she has no tattoos either, but her Gnosis mark may be mistaken for one. The mark is a triangle that sits squarely between her shoulder blades with thick, precise lines coloured a deep shade of blue indigo. Nieve is no more intimidating in her animal form than she is in her human. The size of a slightly small domesticated cat, Nieve is slender and lean, not particularly different from any other domestic cat; her fur is of medium length and patterned tortoiseshell, with the primary colour being a ginger-brown and the secondary a deep brown, with very faint hints of white peeking through on her legs and at her chest. Her eyes don't change much, simply paling slightly and becoming brighter. The one, most obvious thing that separates Evie from the average cat upon first glance is the pair of wings tucked along her flank. Her wings, to those who are knowledgeable about birds, resemble those of a common kestrel's; they're predominantly a reddish brown flecked with a darker brown, and the underside is creamy with brown bars. Her wingspan is approximately 22 inches, just a few inches longer than she is from nose to tail-tip. Last edited by Nieve Glass on March 5th, 2018, 2:59 pm, edited 17 times in total. 'Curiosity killed the cat' is a phrase Nieve often heard growing up; usually said by those older than her (particularly her mother) in order to deter her, it has little to no effect on her. Evie is a bright and inquisitive soul; her attention is caught easily, and she is often curious, not hesitating to investigate things or ask incessant questions. That being said, it is not always easy to hold her attention once it has been caught. With a short attention span, if she deems something in any way boring, uninteresting, or not worthy of her time, she quickly loses interest and moves on to more exciting things. On the other hand, if something manages to hold her attention, she can become extremely fixated on it and will do her best to find out everything she can in regards to whatever it is that has managed to keep her captivated. Nieve has little concept of personal or private; she is often in people's space for some reason or another, and while she is aware of what is considered rude by most people, she simply doesn't particularly care. She has very little modesty and is not self-conscious in the least, unbothered by most things; it is extremely rare for her to become embarrassed by anything. While she has no qualms with getting her hands dirty, and often even enjoys doing so, Nieve can also be vain to an extent and prefers to stay well-groomed in general, particularly in her feline form. She is also more than happy to be the center of attention. If she feels that someone she particularly likes or wants the attention of is ignoring her, she won't hesitate to try and claim that attention back in whatever way she deems acceptable. She can also be exceptionally stubborn when she wants, and can become somewhat sulky and irritated if she doesn't get her way. Perhaps due to her feline nature, Evie is also particularly playful and mischievous; she enjoys chasing, stalking, and pouncing on both things and people. She has no shame and can often be found batting things around in both her human and animal form. She also enjoys teasing those around her, but it's always in obvious good fun. While generally active and fun-loving, like all cats Nieve can also be incredibly lazy; she can and will spend hours simply sunbathing and grooming herself, or settle somewhere comfortable and warm while she dozes the day away. Loyal to a fault to those she likes and aloof with those she doesn't, Nieve is still seeking to the fill the lonely hole in her life that only a bondmate can fulfill; she is naturally an affectionate person, and is freely affectionate with those she considers friends, but she longs for that one special person whom she can adore to no end like no one else. Not only does she want someone she can focus her attentions on, but Nieve also sorely yearns for a confidant; someone she can trust explicitly, and who trusts her just as much in return. Despite her open displays of affection, she is generally a closed-off person; she holds her feelings close to her chest, often becoming distant and cold when she is feeling highly emotional, no matter how close she is with a person. She certainly never talks about her feelings, and she tends to hoard information and secrets but wishes for that one special person with whom she can comfortably share all of these things, without fear of betrayal or misunderstanding. Darcy Glass was a single woman living in Syliras who didn't plan on ever having children; a whirlwind affair with a mysterious foreigner from Eyktol, however, changed those plans. The man had left to continue his travels long before Darcy discovered she was pregnant; still heartbroken from his departure, she decided to keep the child. Thus, Nieve was born. It didn't take long for Darcy to realize that her daughter was not human; her mannerisms combined with her accelerated rate of growth tipped her off, and her suspicions were confirmed when Nieve shifted into her yowlwing form for the first time. Darcy was stunned to realize her daughter was in fact a Kelvic; she knew little of the race, and as far as she knew both herself and the man who had fathered Nieve were purely human. Slightly distressed and unsure how to deal with having a Kelvic child, Darcy simply resolved herself to do the best she could when it came to raising Evie. She did indeed try her best, and while not a bad mother, Darcy was sorely unprepared to raise a child alone, and a Kelvic one at that. Nieve would often spend her days wandering the city and getting into mischief; she never got into any real trouble, and she was usually simply brushed off as a trouble-maker and a nuisance due to her nature, but it still caused Darcy to worry and stress to no end. Her mother often lamented the absence of Nieve's father, and while the Kelvic was curious, who exactly her father had been was a mystery without enough clues to solve. The only thing tangible left by her father was the ocarina he had gifted her mother, which she often played to Nieve when she was young. In an attempt to calm Nieve and keep her focused on more productive things, Darcy introduced her to her trade: pottery. At first, Nieve had no interest in it. It seemed time-consuming and dull to her, and she often brushed her mother off. However, after incessant nagging, Evie gave in and allowed her mother to teach her one day simply to try and please her so she would stop talking about it. To both her own and her mother's surprise, Evie was delighted with pottery. It took more skill than she had thought, meaning it required attention and wasn't nearly as dull as it appeared; she enjoyed the feeling of clay beneath her hands and being able to create things that were both pretty and useful. It instilled a sense of pride in her similar to when she managed to catch a mouse that was roaming the apartment. As she grew older, Evie began to grow restless. It wasn't so much of an urge to travel as it was to find a companion; she loved her mother, of course, but she knew there was something, or rather someone, missing from her life. Almost a year old, Nieve packed what few belongings she had, bid her mother farewell, and boarded a trade ship bound for Riverfall. It was a sad parting for both of them, but they both knew that Evie was not destined for a sedentary life in Syliras simply by way of her very nature; unsure if she would ever see her daughter again, Darcy gifted her the ocarina that had once been gifted to herself by Evie's father. The cliff-side city was vastly different from anything the young Kelvic had ever experienced; while there were moments where she was frustrated by the treatment she received from the Akalak and other residents, as they saw her as nothing more than a pet, Evie enjoyed her time in Riverfall. She picked up some knowledge of unarmed combat, and spent much of her time honing her acrobatic skills by leaping around the city and flying from tier to tier in her yowlwing form. While in Riverfall, Evie befriended a young woman who had been forced into the status of Nakivak after being rescued from a slaver's caravan; the Svefra woman, named Sera, spoke at length about a new settlement across the sea from Riverfall. She called it Syka, and praised it as a beautiful jungle paradise. Her goal had been to travel there to start her life anew, as she had been drifting alone since she lost her pod in the Djed Storm of 512; but that was before she had been captured by the slavers and subsequently forced into being a Nakivak. Sera, much to Evie's dismay, ended up being severely punished for purposefully terminating her pregnancy. Suddenly feeling much less at home in Riverfall, Nieve took the rest of the season to gather some more supplies and any information she could on the region of Falyndar before managing to secure passage to Syka. Nieve had been settling nicely into Riverfall when she first met Sera. She bounded up the stairs of the Cliffside Grotto in her feline form, unfurling her wings and taking to the air with a leap. Flapping hard to gain altitude, Nieve meant to fly across the Bluevein River to the other side when something caught her gaze. A red-haired woman stood alone at the edge of one of the terraces, leaning heavily on the railing. Evie angled her body towards the ground slightly, arcing herself into a circle above the woman to watch her more closely. The lone figure seemed out of place, and the listless form of the woman spoke of sadness. Finally making a decision, she spread her wings wide to glide down and landed on quiet paws beside the woman. Blue eyes cast her way briefly, then returned to gaze out over the edge of the terrace; yowlwing were plentiful in the city. In a swirl of lights, Evie shifted back into her human form, and that seemed to catch the woman's attention. 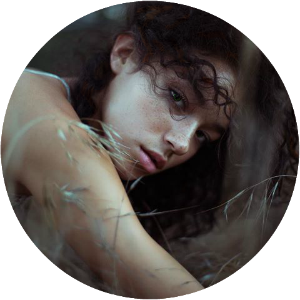 Nieve gave a small toss of her head, narrowing her pale green eyes almost accusingly. "You're not supposed to be sad here. Nobody comes here to be sad." It was a statement, and the petite girl folded her arms over her small chest to emphasize her point. "What's wrong?" So began the friendship of Nieve and Sera the Nakivak. Uncontracted and only working as an apprentice to a seamstress, Sera had a lot of free time and the two began a fast friendship, spending most days together. For awhile Nieve hoped desperately that Sera may be the missing part of her she was seeking, but it quickly became apparent such hopes were in vain. Still, the two were good friends, and Nieve found the Svefra woman's stories fascinating. Over the span of many, many days, Sera opened up and told Nieve her story; how she was the only survivor of her pod, the rest of her family and friends having been killed or lost in the Djed Storm that ravaged the land several years prior. After the devastation and loss, Sera found herself wandering alone for a long, long time. She stopped in Sunberth one day, something she had done countless times before, except that time she didn't leave on her casinor. Captured by slavers, Sera traveled from Sylira to Cyphrus only to be rescued by a group of Akalak; and promptly put back into slavery. It wasn't called that, and it was much more comfortable than many other kinds of slavery, but at the end of the day someone else owned the rights to her and her body. "Because I owe them a debt," Sera said, bitterly. Nieve took this all in intensely; perhaps because of her youth she was naive, but especially to the Kelvic, such a lack of freedom was appalling. "Why don't you just leave?" But of course nothing is ever so simple or easy. Troubled by her friend's predicament, Evie began to snoop around the city. Curious as she was, Evie was often naturally inclined to listen to other people's conversations, but now she had a purpose. Nobody paid any mind to another yowlwing sunning itself on a windowsill, wings splayed lazily; but while she did so, Nieve kept her ears up and alert and took in all the information she could. Some of it quickly bored her, and she would actually doze off, or otherwise she would abruptly stand and leap down to prowl the streets for a better conversation to eavesdrop on. Sometimes, she got lucky, but that was much more rare and the information she picked up was often spotty, in broken bits and pieces. Gradually, however, she put together that it wasn't quite as simple as just paying your debt to be able to leave the life of a Nakivak; it seemed that woman who could birth Akalak children were indeed rare. Unease rippled through Evie as she remembered the conversation she'd overheard of an Akalak lamenting this, and how much easier it would be if only Kelvic could be Nakivak, only to have his companion laugh at him for such a thought. Then one day, Sera met Evie with her silver undan having been replaced by a golden one. The Svefra woman was clearly upset; while she had never been explicitly told how fatal it could be to birth an Akalak, to avoid upsetting or frightening her, it didn't take much to put it together. Not even Nieve had said a word to her, not wanting to distress her friend further, instead keeping the information to herself. Time passed and Nieve saw Sera less and less, and the Kelvic gave up on the idea of freedom for her friend; until one day she stopped seeing Sera all together. A few days passed, and there was still no sight of the redheaded Svefra woman. Uneasiness curled in Evie's stomach; as busy as she had become, there was no reason for Sera to have suddenly disappeared completely. Certain that something must have happened, Evie picked up her habits of slinking around and eavesdropping with purpose once again. However, she wasn't able to find much, until one day an idea struck her. She had never met Sera's patron or even heard his name, but on one or two occasions she had met the Konti woman that had been her Advocate. With a little bit of work and a little bit of luck, Nieve managed to track the Konti down. It was evening when she knocked on the woman's door, and the Konti gave a somewhat confused but polite smile. "Can I help you?" She didn't seem to recognize Evie. "I need to speak with you about Sera." Recognition then flashed in the Konti's eyes, followed swiftly by an emotion that Nieve couldn't place. The Konti woman, A'lienna, almost closed the door on her, but eventually allowed her inside. Bustling around, she snatched a bundle of herbs with long stems boasting white flowers off of the table and put them away, moving throughout her house and tidying other things as well; folding a blanket, taking a mug off of the table, straightening a few books. Nieve watched her do so with keen eyes. "Do you know where she is?" The Konti froze for a moment, opened her mouth to deny it, then seemed to realize there was little use in lying. "I might," she finally said, evasively. "I can't tell you, though." Nieve didn't take no for an answer so easily; she continued to press until finally the Konti snapped. "It's best for everyone that you don't know. You have nothing to give me in return for telling you, in any case. If you had something useful to offer me perhaps I'd be willing to share this secret." Leaving A'lienna, Evie began to think, mulling over the woman's words; what could she ever have that the Konti would find useful? She had nothing of value and little coin to her name. The word 'secret' returned to her then, and for the first time Nieve began to truly realize the power of information. "Perhaps a secret for a secret," she murmured to herself, making her way down a winding staircase. It was not a simple task. Nieve hung around A'lienna's home often in her animal form, cautious not to directly watch the Konti for fear of being caught; she also lounged on the Konti's neighbours doorsteps and windowsills, but nothing the Kelvic deemed useful ever came up in conversations she overheard. She stumbled upon the information she needed almost completely by chance. Having come down with a slight cold but not willing to go to a medical center, Nieve had wandered into a small herbalist shop; in her browsing, a familiar-looking herb caught her eye, and she recognized it as the one she had seen at A'lienna's home. More out of a simple curiosity than anything else, Evie asked the older woman who ran the shop what the herb was for. "That? That's fairy candle, my dear. A blessing for those poor women that suffer painful monthlies, but I'm always careful of who I sell it to. It's a shame, but some poor girls will try and use it to terminate their pregnancies, did you know?" The woman shook her head with a click of her tongue, but Evie paid it no mind, for things had suddenly come together with enormous clarity in her mind. Thanking the woman, she dashed off without even buying the herbs she'd originally gone to look for. A secret for a secret, or so she'd thought; but what about a secret for silence? It was then that Nieve began to realize the power that information could hold; secrets could be bartered like currency, and sometimes one was willing to pay the highest price to simply keep one close to the chest. 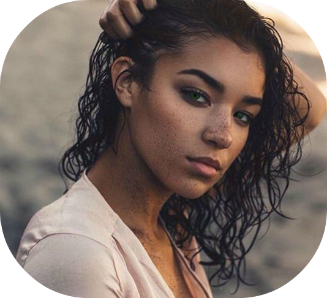 She found her way to A'lienna's home, not bothering to attempt to be casual; she simply asked straight out why the Konti woman, an Advocate at that, would have something like fairy candle in her home. Guilt weighed heavy on Nieve at the fear in A'lienna's face, but as she had thought, the Konti gladly spilled all she knew for the sole demand of Evie's silence on the matter. 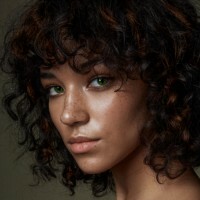 A'lienna had warned Sera of the dangers, but the Svefra had been adamant, and so A'lienna quietly supplied the girl with tea made from the herb. It wasn't long until she was taken to the Oathmaster's Tower, and she hadn't been seen since. A'lienna warned Nieve that such a crime would not go unpunished, and the punishment would not be light; but the Kelvic had to know for sure for herself. She had come this far already. There was no way of sneaking into the Tower, of that A'lienna had assured her; so instead Evie returned to her usual ways of simply listening unobtrusively. It did not take her long to discover the truth; through the windows of the first floor, which she lounged underneath, she could hear the nurses speaking. They often gossiped when they had nothing pressing to do, as women were prone to do, and a recent favourite topic was the poor Svefra woman who had purposefully terminated her pregnancy. "What happened to her?" One of the nurses asked, as Nieve listened quietly. "What do you think? Killing an Akalak child, even just in the stages of pregnancy...well, it certainly isn't a light sentence." There were quiet 'tsks' and murmurs of varying opinions, but Nieve tuned them out. She had known deep down, but she had to be certain of it; and now she was. That night found Nieve leaning against the same railing Sera had been when they first met, out on a terrace along the Cliffside Grotto. Quiet tears slipped down her cheeks; she had known and loved deeply and truly only two people so far in her short life. Her mother, whom she very well may never see again, and Sera. Behind her, a deep but soft feminine voice suddenly spoke. "Don't cry, little one. Such is the way of life. Debts are owed and they are paid, no matter the cost." Nieve turned her head, and her breath caught. She almost didn't see the woman at first, so well did she blend in with the darkness around her; her skin was a deep blue-black, the same shade as the night sky, and her eyes were a startlingly intense silver. Evie had never been particularly religious; her mother had been devoted to a few deities, but she herself had never seen the appeal or caught interest in it. But standing in front of the Goddess of Night and the Mistress of Shadows, she felt both elated and humbled; is that the feeling that drew her mother and so many others to worship the many Gods and Goddesses? She said nothing, but the Goddess before her didn't seem to mind, and continued to speak. "I have had an eye on you for sometime. You are a natural seeker, aren't you? So inquisitive. I was hoping you would prove yourself, and you have. You did well to discover the truth of what happened to your friend, seeking secrets and wielding them; as armour and weapon both." The gentle praise sent colour rising to Nieve's cheeks, where her tears were beginning to dry. "Thank you," she finally said quietly, unsure of how else to respond. "Take my gift, seeker. Allow the shadows to be your friends; friends you can never lose, and friends who will help you find your secrets should you ask them nicely enough." There was almost something like amusement in the Goddess' voice for a moment, but it was quickly gone. She reached out and wiped the remaining tears from Nieve's cheek with a gentle but firm hand, and the Kelvic gasped quietly as she felt the space between her shoulder-blades tingle; it was intense, yet not quite painful, and passed quickly. Ever so suddenly, she was aware of the shadows around her cast by the lights in the garden; they flickered and swayed with a life of their own she had never before realized, and whispered to her with strange words in a strange language she somehow recognized. Akajia watched her carefully, and Nieve could only repeat herself, somewhat struck dumb by the Goddess' gift and the sudden revelations she was having. "Thank you." The Goddess dropped her hand from Evie's cheek with a satisfied nod. "Use it well, winged one. I may call upon you again someday; but until that time comes, you will never again be alone. Now, go; there is nothing left for you here. Your future lies elsewhere, on different horizons, ready for you to seek it." Nieve knew instantly what was meant by the words, for truthfully the idea of travelling to Syka had long been living in her subconscious, ever since Sera had mentioned it. "I will," Nieve said, a sudden wave of determination washing through her. "I will go, and I'll find what I'm looking for." It was true that there was nothing left for her in Riverfall; she no longer felt welcome in the city. It was time she began forging her own way. "Until we next meet," Evie nodded respectfully to the Goddess, who seemed pleased. After a moment, she simply vanished, as if swallowed whole by the night. For a long minute Nieve wondered if she had not just imagined the entire thing, but the whispering of the shadows around her confirmed it. She greeted them, hesitantly at first and then delightedly, and they greeted her back; laughing, Nieve left the terrace with new purpose in her step. She had travels to prepare for. Last edited by Nieve Glass on January 29th, 2018, 3:02 am, edited 7 times in total. *Shape-shifting: Can change between her human form and yowlwing form at will. *Decreased lifespan: Matures and ages at the rate of her animal form, giving her a life expectancy of 12 - 14 years. *Animal speak: When in her yowlwing form, she can fluently communicate with other felines, largely through body language but also with some verbal elements. She can sometimes have trouble communicating with big cats. *Night vision: Pupils expand and contract intensely even in her human form to use as much light as possible, allowing for better vision in darkness than the average human. *Acute sense of smell: Largely due to the scent organ on the roof of her mouth that is present in both her feline and human forms, she has a sharper sense of smell than any normal human, but can be sensitive to strong odours as a result. 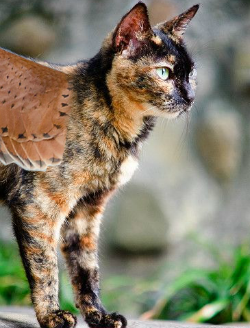 *Flight: Due to her wings, she is able to fly while in her yowlwing form. She can sustain herself for approximately a mile at a time at a speed just slightly faster than her yowlwing walking speed. *Shadow speak: The singularly marked individual instantly knows the language of Makath and can communicate with shadows. They suddenly understand that shadows are not simply the absence of light in an otherwise lit space or the rough image cast by an object blocking rays of illumination. Shadows instead become sentient creatures for those Akajia marks. Because they become sentient creatures, the Night Stalker can talk to them. This does not mean that the individual can get them to tell him or her what he wants to know. Time and reputation must be built at this level, and shadows must be befriended. *Shadow vision: Night Stalkers with one mark can see clearly into shadows as if they are not there, although shadows do not disappear for them completely. Night Stalkers with one mark have excellent night vision and often feel at home in the complete darkness. *Secret keeping: At this level, the marked begin to yearn to know secrets and their ability to ferret them out begins to manifest. Night Stalkers literally often stumble upon mysteries and cannot simply help but solve them in their own minds. A Night Stalker keeps secrets and are truly reluctant to give them up; however, they can be 'convinced' to through bribery, torture, or simple exploitation. Last edited by Nieve Glass on June 30th, 2018, 4:22 am, edited 12 times in total. 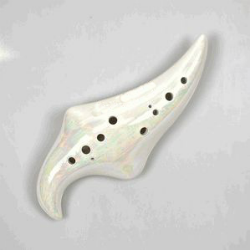 Evie's heirloom is the ocarina that once belonged to her mother, a gift from her father from the brief period in which he was with Darcy. Nieve has fond memories of being young and having her mother play the instrument to her and she is much more fond of the high sounds produced by it than any other instrument she's ever heard. She's taken it upon herself to learn to play the instrument, but is still very new to it and is learning mostly through trial and error. The ocarina itself is fairly small, able to fit into Evie's hands easily. It's a shining white with an opalescent sheen, possibly made out of glass or shell, and has 10 finger holes. Found in the sand at Treasure Point, Nieve has yet to discover the properties of this amulet. When you hold it in your hand and turn a careful circle until you stand in whichever direction the person, place, or thing that you desire will cause the amulet to glow. The person place or thing you desire can change moment to moment. It will continue to glow as long as you concentrate on that object of desire and point in the direction it lies relative to you. This item will only work if you are within a 10 mile distance of the one thing you desire. House: Upon arrival in Syka, Nieve claimed 5 acres of land in the settlement. Sitting beside the Panacea just to the west in view of Solitude Isle, about an acre and a half is a vast expanse of white sand while the remaining 3 and a half acres stretches back up into the jungle. Evie picked a parcel of land with an excess of underbrush and low-to the ground plants, as well as with a few fruit trees of the mango, banana, and coconut variety near the treeline. A narrow stream meanders through the piece of land a few feet into the jungle, still in view of the beach. It's not impressive, but it provides fresh water for drinking and bathing, as well as providing a source of small freshwater fish should Evie ever feel the urge to try her luck. It also serves a source of clay for Nieve to make pottery with. A thin coconut palm tree grows further down the beach towards the water's edge; it is bent at a particularly steep angle and hangs out over the ocean, and is often used as a perch by Nieve. Evie has set herself up rather comfortably on the beach. Far enough back that the tides aren't an issue, but far enough from the treeline that she doesn't feel endangered, she has her 4 person tent set up to face the ocean. She's draped insect netting over the tent that she can pull down to cover the entrance, and keeps a tarp tucked into the corner of the tent ready to be draped over it should it rain. A fire-pit sits about 4 feet from the entrance of the tent, close enough that she can enjoy the warmth of it while lazing in her tent but far enough that the flames never pose a fire hazard. Inside the tent, she has a blanket laid out on the ground and her bedroll on top of that in the back corner with her lamp sitting within arms reach. In the opposite corner sits her backpack and her spare gear and clothes, along with her potter's toolkit. A hammock has been hung between two trees at the forefront of the treeline near her tent, strategically placed so that it is always shaded should Evie ever want a respite from the heat. A fair distance from her tent, away from the Panacea and closer to the treeline, Evie has outlined a large square in the sand where she plans on setting up a makeshift firepit kiln, hoping to eventually build a slightly more permanent one from bricks. Last edited by Nieve Glass on September 4th, 2018, 1:10 pm, edited 14 times in total.